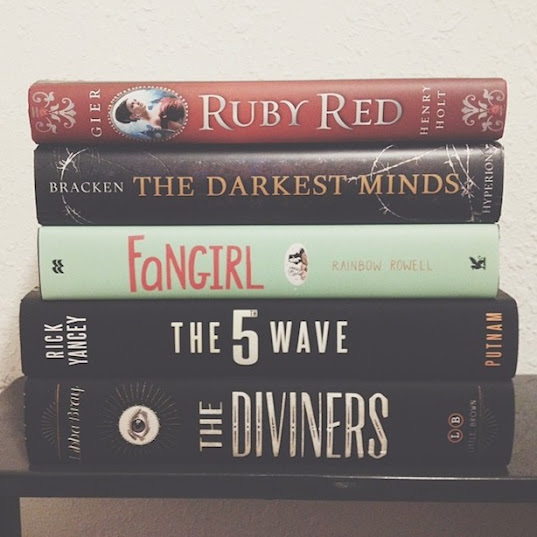 amarisafloria: First 2014 Book Haul + February TBR! First 2014 Book Haul + February TBR! I don't usually do back-to-back posts on the same topic, but I really wanted to share a mini book haul with you all and tell you about #AYearAThon, the read-a-thon I joined that started TODAY! As the name suggests, there will be a read-a-thon with a different theme every month. This month, from February 3 - 9, we will be reading anything and everything related to Harry Potter! (I'll be tracking my progress on Twitter.) If you want to join us, just visit us here :) If you don't want to read Harry Potter in February but would like to see what else we're reading in the future, check out this schedule. Now, onward to the books I purchased a week ago! If you follow me on Instagram, you've probably already seen this. Target was being a little generous with its prices and I caved. I usually purchase paperback versions, but I couldn't help myself this time! The paperback cover of Ruby Red does not hold a candle to the hardcover cover, so it wasn't a question whether or not I should pay a little extra for the hardcover. I already placed an order on Book Outlet for the second book and can't wait to find the last one! The Darkest Minds has been a top book of 2013 for a lot of the book vloggers I watch on YouTube, and Fangirl is too cute to deny from my collection. I've already finished it and thoroughly enjoyed it. (More on that at the end of this month!) I heard about The 5th Wave via Priscilla from The Readables but did not care to purchase it until now, and The Diviners was a necessary purchase after Regan from Peruse Project continuously mentioned it in a couple of her videos. Along with these books I purchased, I'll also be attempting to read the entire Harry Potter series (even after the read-a-thon ends) during the month of February. It's one of my 2014 reading goals and I'm happy to be completing a huge goal this early in the year. Realistically, I don't think it's possible for me to complete 11 books in one month (I am a full-time college student), so I'm thinking this will be my TBR (to be read) for March too. Many of the books above are ones that I've been wanting to read for a while!! Currently I need to finish reading The Graveyard Book, Allegiant, and Persuasion! Awesome haul! I'm currently reading The Fault In Our Stars finally and I'm tempted and a bit scared to jump in on A Game of Thrones.